One last trip of the year, and beginning of the next to discover some Caribbean islands on a winter cruise, escaping the cold weather back in Europe. A cruise is actually the only feasible way to visit these islands, many of which are tiny independent country-islands and therefore, rising the total count of countries visited so far to date to 99 by the end of the cruise; over half of the world’s total which stands as of December 2018 at 195. So starting with one of the largest, Barbados, and its beautiful World Heritage Site listed by the UNESCO, its colonial capital, Bridgetown, one of the major international ports in the Caribbean for cruises. Founded by the British on 5th of July 1628 as a traditional English medieval market layout town, was raised to city status from 1842 after the Saint Michael’s Parish Church was elevated to the status of Cathedral. Then considering all other islands and their respective capital cities, Bridgetown remains as one of the largest and one of the most historic and therefore, touristy due in part for the large amount of colonial structures so well preserved and of course, the beaches and great resorts around the rest of the island. Now, considering the fact of how small it is and how straightforward it is to visit, there won’t be too much more to add rather than the obvious section of what to see and do. Still, Barbados has more to offer than just Bridgetown or what many see it as their port of arrival. The island was visited by Spanish navigators in 1511 who claimed if for the Crown, however not much they did until the arrival of the English, developing it into an important sugar cane production, and leaving quite a large legacy of structures all over the island. Now bearing the nice tropical beaches such as Carlisle Bay, Crane Beach, Long Beach, Bottom Baya and Paynes Bay and the grand resorts all around where you can enjoy anything you like, another of the major sights in the island is the Harrison’s Cave, located pretty much in the centre of the country; but saying it, that’s pretty much it for Barbados. For more information check Wikipedia site. Barbados currency is the Barbadian Dollar (BBD) although widely used is the USA Dollar. Please note that any price reference is true as from when this guide was created, therefore check prices in advance as with the time they change. Harrison’s Cave At the centre of the island, difficult to imagine considering how flat the country is, but this underground cave is full of stalactites and stalagmites, and even a lake. Paynes Bay Beach The principal beach area along the west coast of the island, north of Bridgetown. Bridgetown The small capital city of the island, known for its colonial heritage listed as an UNESCO World Heritage Site. -Mount Gay Rum Distillery The worldwide famous rum from Barbados is here produced. Sugar cane was the principal agricultural crop in the island, nowadays not as important but the legacy is clear. A tour of the Visitor Centre facilities costs $8, or BBD16. It is considered as the oldest rum in the world. -Broad Street The main street in the city, running west to east, home to the major landmark buildings. -Saint Mary’s Church The second oldest consecrated in the island, from 1825. It’s by the westernmost end of Broad Street, by the Jubilee Gardens. -Barbados Mutual Life Assurance Society Building One of the most prominent colonial structures in the country. -National Heroes Square Formerly known as Trafalgar Square. It is the easternmost terminus of Board Street. -Parliament Building Established in 1639, making the third oldest Parliament in the entire Commonwealth. -Treasury Building Aligning the eastern side of the square. -Dolphin Fountain and War Memorial By the centre of the garden. -Chamberlain Bridge At the southern side of the square, crossing across the Carenade. -Cathedral of Saint Michael and All Angels Behind the Treasury Building just a street beyond. Originally dating from 1665 as a church, rebuilt in 1789, then elevated to Cathedral in 1825. -The Jewish Synagogue The oldest in the Western Hemisphere, located at the north of the city centre, 3 streets beyond Broad Street. -The Carenade The main marina within the city centre of Bridgetown, at the mouth of the Constitution River. At both sides are pedestrian promenades offering nice views of the buildings at each side. -Carlisle Bay Beach The main beach in this part of the island, south of the cruise terminal and The Carenade. 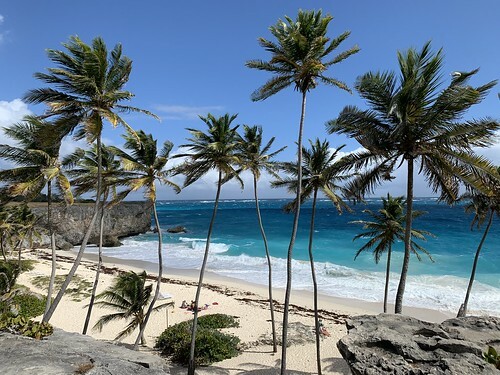 -Garrison Historic Area Home to the headquarters for members of the British West India Regiment in Barbados during the 18th and 19th centuries, and site where the Independence was proclaimed in 1966. It is listed and UNESCO World Heritage Site. Long Beach Just south of the airport, east of Bridgetown. One of the longest beaches in the island. Crane Beach Farther east after the airport. Small yet secluded, makes it perfect for escaping the other busier ones. Bottom Bay Beach Continuing east along the coast, for a true real piece of paradise, however notice that all these beaches are in the Atlantic coast, hence not calm waters, rather big currents and waves. The main gateway into the city is Sir Grantley Adams International Airport, with flights to the USA, the Caribbean and Europe; secondly, its port serves an enormous activity through the year with some of the biggest cruise ships in the world. Bridgetown is one of the major ports in the Caribbean, and generally an starting/ending point of a cruise. The cruise terminal is within walking distance of the city centre and most of the sights, the city is small enough to walk everywhere and in a short time. Public buses do cover the entire island, hence for someone willing to get elsewhere other than Bridgetown, best would be asking at the tourist information for some routes. Although the best and fastest would be to get a car or negotiate one of the multiple and easy to find van/taxi drivers to be with you for the entire duration of your day going to the major sights or wherever you have planned to visit. As an idea of what cost to expect, set aside around $US 30 per person if you are 2 people, and around $US 25 per person or even a bit less if your negotiation skills are good if you are 4 people. Since this was a cruise holidays and we slept always on-board, there is little I can say about accommodation here in Barbados other than the usual, checking some of our preferred affiliate hotel search engine such as Hotels.com, Booking.com, Expedia, Otel.com, Agoda, Opodo, LateRooms or Ebookers. Nevertheless you are in a highly desired holiday island with grand hotels and almost every worldwide chain, however, it will not come cheap like anywhere else in the Caribbean. This entry was posted in 01. January, 04. North America, 08. December, 2018, 2019, Barbados, Big Trips and tagged Barbados, Bridgetown, Caribbean, Cruise, MV Azura, North America, P&O Cruise. Bookmark the permalink.